Trees/bushes with stretching arms and legs that have come to life. 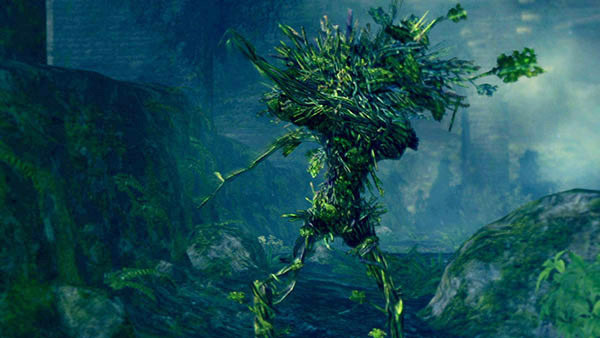 Common enemy in the Darkroot Garden. Medium range single whip attack. Medium range double whip attack. Ambush - They hide as bushes that are slightly darker in color than area decorations. It is possible to damage them while they are buried. Either by shooting them with a manually aimed weapon, using an attack that smashes the ground (e.g. strong greatsword attack), or using magic that has an area of effect. Fairly straight forward. Watch out for their spiky heads sticking out of the floor, so you can easily predict when they ambush. Wait for their whip attack and counter with fire-based damage. If you get close to one that is still buried (usually easiest down at the swamp area, near the stone giants) and you have a weapon with a wide arc (such as an uchigatana), you can hit them before they even emerge, though hitting them will wake them up and cause them to pop out of the ground. It is possible for their grab attack to glitch you through the floor if your character is elevated higher than they are. This is most prevalent on the stairs leading to the Moonlight Butterfly boss fight. You can interrupt all of their attacks with fast weapons. They have almost no poise. 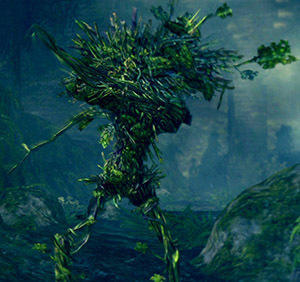 Farm these enemies before going to Blighttown for poison and toxic removing Moss Clumps. They have a high drop rate.